object oriented design – Java, SQL and jOOQ. The visitor pattern is one of the most overrated and yet underestimated patterns in object-oriented design. Overrated, because it is often chosen too quickly (possibly by an architecture astronaut), and then bloats an otherwise very simple design, when added in the wrong way. Underestimated, because it can be very powerful, if you don’t follow the school-book example. Let’s have a look in detail. Right. For the 98% of us thinking in wheels and engines and bodies in their every day software engineering work, this is immediately clear, because we know that the mechanic billing us several 1000$ for mending our car will first visit the wheels, then the engine, before eventually visiting our wallet and accepting our cash. If we’re unfortunate, he’ll also visit our wife while we’re at work, but she’ll never accept, that faithful soul. OK, so we’ll “visit” folders and every folder is going to let its files “accept” a “visitor” and then we’ll let the visitor “visit” the files, too. What?? The car lets its parts accept the visitor and then let the visitor visit itself? The terms are misleading. They’re generic and good for the design pattern. But they will kill your real-life design, because no one thinks in terms of “accepting” and “visiting”, when in fact, you read/write/delete/modify your file system. This is the part that causes even more headache than the naming, when applied to the wrong situation. Why on earth does the visitor know everyone else? 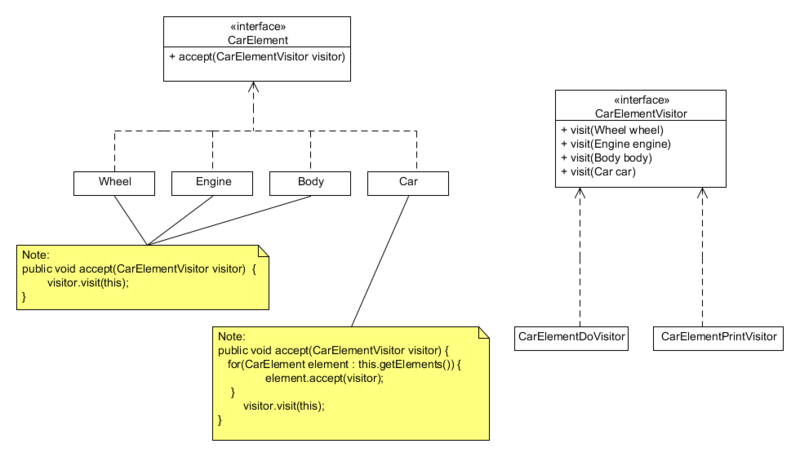 Why does the visitor need a method for every involved element in the hierarchy? Polymorphism and encapsulation claim that the implementation should be hidden behind an API. The API (of our data structure) probably implements the composite pattern in some way, i.e. its parts inherit from a common interface. OK, of course, a wheel is not a car, neither is my wife a mechanic. But when we take the folder/file structure, aren’t they all java.util.File objects? I still dislike the naming, but the pattern works perfectly in this paradigm. So when is the visitor pattern “wrong”? There are many more. Each one of them must be able to perform two actions: render SQL and bind variables. That would make two visitors each one knowing more than… 40-50 types…? Maybe in the faraway future, jOOQ queries will be able to render JPQL or some other query type. That would make 3 visitors against 40-50 types. Clearly, here, the classic visitor pattern is a bad choice. But I still want to “visit” the QueryParts, delegating rendering and binding to lower levels of abstraction. How to implement this, then? It’s simple: Stick with the composite pattern! It allows you to add some API elements to your data structure, that everyone has to implement. Combined, we can now easily create conditions of this form: ? BETWEEN ? AND ?. When more QueryParts are implemented, we could also imagine things like MY_TABLE.MY_FIELD BETWEEN ? AND (SELECT ? FROM DUAL), when appropriate Field implementations are available. That’s what makes the composite pattern so powerful, a common API and many components encapsulating behaviour, delegating parts of the behaviour to sub-components. If you have many many visitors and a relatively simple data structure (few types), the visitor pattern is probably OK.
To allow for simple API evolution, design your composite objects to have methods taking a single context parameter. The “Context Pattern” is at the same time intuitive like the “Composite Pattern”, and powerful as the “Visitor Pattern”, combining the best of both worlds.